What we have here is a couple lines from Hachi no ki , as edited by KANZE Sakon XXIV 廿四世観世左近 in the mid-1960s for Hinoki Shoten. 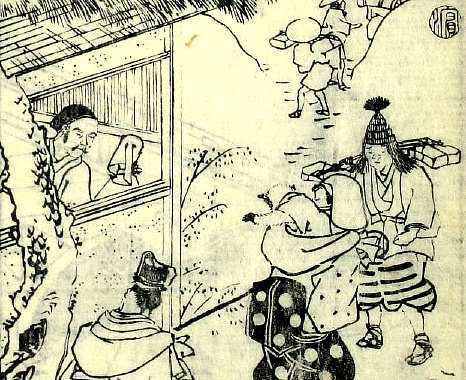 Hōjō Tokiyori (the waki of the play), disguised as a traveling priest, is trying to persuade impoverished ex-noble Tsuneyo (the shite) to let him crash during a snowstorm. Tsuneyo: What you ask is simple enough, but my home is too humble; you simply cannot stay here. Tokiyori: No, no, the humblest of lodgings I would yet humbly accept. Please, allow me to stay here just one night. The meaning here is the same as any other dakuten: "the first consonant sound represented by this character is voiced." Thus, this word is pronounced migurushiki. I'm not sure how likely anyone is to say mikurushiki in this case (although there is a pun on regular kurushiki involved too), but the kanji dakuten also turns up in places where there is a geniune ambiguity, like on 嶽 (mountain peak) to indicate that it's dake, not take. The inhabitants of OneState have only numbers, no names, and they all wear the same uniform, only the word "uniform," the author tells us, hasbeen worn down by time to "unif." That's what Zamyatin writes in Russian, the Cyrillic equivalents of those four letters: u-n-i-f. All previous translators known to me have opted for "unif" in their English versions. This struck me as wrong. I did not think an English speaker (and an English translation has no other point than to make the characters English speakers) would naturally come up with "unif" as the worn-down stump of "uniform." So I made it "yuny," jettisoning the f (which seemed to me especially clumsy when clustered with an s in the plural: "unifs") and adding an initial y to make the pronunciation unmistakable. This is a good idea gone terribly wrong. "Unif" is indeed an unnatural abbreviation for an English-speaking community to come up with, but I find the bizarre spelling of "yuny" even less believable. What's more, Brown's explanation reveals that "yuny" is not just stupid but also patronizing. Seriously, who is this sheltered flower Brown is writing for, whose education has led them here — the Penguin Classics edition of a Jazz-Age Russian dystopia — without ever clarifying the pronunciation of the prefix "uni-"? Mind you, "yuny" would be fine if it were part of a general worldbuilding-through-language-change approach. I have no objection to Orwell's "Miniluv" or Burgess's "gulliver." But a single radically changed term (for something quite peripheral) in a sea of standard British English makes no sense. It's especially weird given that the rest of Brown's translation is eminently readable, indicating that he made natural-sounding English a high priority. He may have been driven temporarily mad with power. OK, in the first place, it's not from English but French; the Russian note in Chapter 2 on "в голубоватых юнифах" ("in light blue yunifs," the first occurrence) says "Вероятно, от древнего 'Uniforme'" — "probably from the ancient 'Uniforme'." In the second place, I think rendering it "yuny" is a lousy idea based on an incoherent thought process; it makes it look like a direct rendering of a Russian word, which it's not. If you're going to go with "uni," why not spell it "uni"? But yes, ending the shortened form with a consonant is more natural in Russian; it makes it easier to add case endings (like the locative plural юнифах in the above quote). Background information: the normal Russian word for uniform is форма (forma), which is (via Polish) from Latin forma. There is a word униформа (uniforma — n.b. : starts with u-, not yu-), but it's archaic and I'm not sure how many Russians are familiar with it. My latest (and extremely late) piece about the word nyorai is up at Néojaponisme. "The etymology of the original term is unclear": this is the part I wanted to expand on. Sanskrit grammar offers two possibilities for breaking up the compound: either Tathā and āgata or Tathā and gata. Tathā means "thus" in Sanskrit and Pali, and Buddhist thought takes this to refer to what is called "reality as-it-is" (Yathā-bhūta). Thus in this interpretation Tathāgata means literally either, "The one who has gone to suchness" or, "The one who has arrived at suchness." Note that the standard Chinese translation of the word, 如来, implicitly accepts the latter derivation (or a simpler version, like "[one who has] thus come"). The Iwanami Dictionary of Buddhism (岩波仏教辞典) confirms that almost all Chinese translations of Buddhist texts do indeed use 如来... which is actually kind of tantalizing — there are some texts that use 如去, "thus gone"? Hmm. Semimaru died one thousand years ago, but he lives on in the Japanese cultural consciousness as a fierce avatar of ambiguity, a presence whose sheer liminality tears once-happy families apart each new year. Is he a priest, or just bald? * Does the term bōzu include bald non-monastics explicitly, or only metaphorically? When playing bōzu-mekuri with your cousins, these issues are very real. Semimaru's work stands out in the HI and indeed among classical Japanese poetry in general: it is crowded, lively, and cheerful where most of its competition is lonely, limpid and melancholy. Which isn't to say it isn't part of the tradition: note that the placename Ōsaka 逢坂 (/afusaka/ at the time, literally "meet - slope", translated "Meetinghills" here) does double duty as the word au (/afu/), "meet," in a very traditional way. One aggressively modern metaphor for this poem is the binary tree: kore ("this") as the node at the bottom, dividing into branches that end in pairs of opposites: "go" vs "come," (actions) "known" vs "unknown," (states) and "parting" vs "meeting" (interactions). The difficulty here would usually be tying this back into an ending; Semimaru manages it by only providing half of the final pair ("parting..."), dialing up the tension by wedging "known and unknown" in, and then closing the open pair with a line designed to overflow the buffer and construct the final image ("...meeting→hills gate"). To switch metaphors, Semimaru cracks the fundamental meaning-atom "this," then uses the rules of his literary tradition to channel the resultant explosion of dualities back into a singular "that": the gate, an image that combines separation and unity. In this picture Semimaru is played by Bill Murray. They meet and rest awhile. 'Tis the gate of "Meeting Hill." meet at the Barrier of Ōsaka. The "continually" is in there because he is using a variant which has wakaretsutsu instead of wakarete wa. He also provides a good argument, quoting Susan MATISOFF and ORIGUCHI Shinobu and based on comparisons to other poems beginning kore ya kono, for the -tsutsu version's authenticity. That said, I don't think that "continually" really works in this case: I see the pairs as one-two punches, and it's just awkward to keep the "one" conceptually pressed against the reader's jaw while you're winding up for the "two." Translating seki as "barrier" instead of "gate" is also of interest. The items in question were indeed intended more as an obstruction to (or at least moderator of) passage than a facilitator of same. "Checkpoint", as in "Charlie," gets pretty close, too, but is a little too modern. Porter's "stile," though, is right out. Note that these two sponges have distinct functions. The doggy sponge is for cleaning the sink. 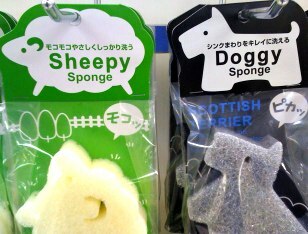 The sheepy sponge is for washing things "fluffy-gently but firmly" (モコモコやさしくしっかり). Their speech balloons reinforce this: the doggy sponge is saying "Pika[t]! ", mimetic of a sudden glint of light, e.g. the reflection off a freshly-cleaned sink, and the sheepy sponge is saying "Moko[t]! ", mimetic of... a sudden burst of fluffiness. So, the sheepy sponge is not simply sheep-shaped. It also mimics the characteristics of a sheep. I submit therefore that one likely explanation of its name is not "sponge shaped like a sheep," but rather, "sheep-like sponge." It is not a "sheepy." It is sheepy. Similarly, the doggy sponge's model is explicitly identified as the scottish terrier, known for its tough, wiry coat. Thus, the word "doggy" might be better understood as "doglike; canine" rather than "dog [dimun.]" My suggested follow-up research program would focus on future products released by the same company. Product names using comparatives or superlatives ("doggier sponge," "cattiest tea-towel") would constitute evidence in support of my hypothesis, while names containing unambiguously nounal descriptors would be evidence in the other direction. Although they might pose entirely new interpretation problems as well: "parakeet drying tray," etc. Look at that stylized cutlery trio! Even as the trees that whisper round a temple become soon dear as the temple's self, so does the spoon—or rather, the knife; I love the way they've solved that "one of these things is not like the other" problem. "Hurry up! The boss has already put on his nafkin, picked up his knife, and started licking his chops; he can't wait to see you." The two gentlemen cried and cried and cried and cried and cried. Both variants remain in use in modern Japanese, too. This dude claims that nafukin is mostly a primary/secondary school thing, and possibly an attempt to separate the napkin-for-blood/napkin-for-food concepts, in order to shield delicate children from the harsh realities of biology. This may be so, but googling reveals that this semantic differentiation is only maintained sporadically (mostly on blog posts about this very topic) out in the real world. It isn't usual for /p/ to become /f/ in Japanese loanwords from English, so what caused it here? Rogue strain of Grimm's Law, perhaps introduced by an escaped Prussian circus monkey in the Meiji period? Prehistoric Japanese sound shifts revived and enraged by atomic testing? No: Word on the streets is that it was interference from the Sino-Japanese word fukin 布巾, conveniently meaning "scrap of cloth."